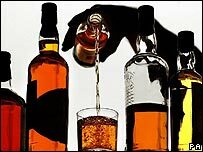 The amount of scotch whisky sold abroad rose to record levels last year as more than one billion bottles were exported. The value of global sales rose 4% to £2.5bn ($4.9bn), representing a quarter of all the UK's food and drink exports. There was growth in all leading markets in Europe, the Americas and Asia with demand in Venezuela, China and South Africa particularly buoyant. The industry has recovered strongly in recent years after Asia's financial crisis hit sales in the late 1990s. Diageo, the world's leading scotch producer, recently announced plans to invest £100m on upgrading its distilleries across Scotland, a move which was seen as a signal of health in the industry. The latest sales figures, published by industry body the Scotch Whisky Association (SWA), were derived from HM Revenue & Customs sales data. Sales volumes rose 6% to 1.051 billion bottles last year, eclipsing the previous high of 1.013 billion in 2001. The best previous year in terms of sales value was 1997, when sales totalled £2.4bn. The US remains the industry's most valuable market, with sales rising 7% to £400m. Venezuela, however, saw the strongest growth last year, as sales rose 45% to £106.7m. There was also encouraging growth in China, where demand for whisky has taken off in the past five years. China is now among the industry's 10 biggest markets. The industry said its prospects were brighter than they had been for many years. "I am greatly encouraged that distillers, large and small, are investing in facilities in Scotland and taking advantage of opportunities worldwide, with markets in Asia, North and South America offering strong potential for growth," said Richard Burrows, SWA chairman.